An Nsuta Circuit Court in the Ashanti region presided over by Justice Abdul Yussif Assibey on Thursday, March 28th, remanded Attah Akosah, a 27-year-old Farmer at Benim in the Mampong Municipality into prison custody. According to the judge's sentence, the accused used an offensive weapon and caused harm to Benjamin Acheampong, a student of the Adu Gyamfi Senior High School located in Jamase. He pleaded not guilty to the two counts and was remanded in prison custody to reappear before the same court on Thursday,April 18,2019. DSP Ransford Nsiah prosecuting, recounted that on Wednesday, March 20, 2019, the victim, together with his colleagues went to a riverside at Benim in the MAMPONG Municipality to fetch water. He said they met the accused having his bath in the river so they asked him to come out to enable them to fetch some of the water. The prosecution said the accused became offended, took a cutlass and slashed the head and the neck of the complainant who felt down and became unconscious. 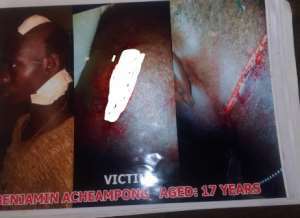 He said his colleagues rushed him to the Mampong Government Hospital for treatment and reported the case to the Asaam District Police. After an investigation, the police arrested the accused and after that charged him for the offence and brought him before the court.